This past week we have been with friends working through the loss of their Japanese dads. Yesterday we visited the family of N., one of our Nozomi women, whose father passed died on New Year’s Eve. She and her family are still physically and emotionally recovering from the tsunami. Their home was washed away; Eric and a team of guys last fall helped move a few of the remaining trees and large rocks from that property to where they are living now in downtown Ishinomaki. She had been carried with the house, in the tsunami, her body held under the freezing water by wet tatami flooring for many hours. She continues to see a doctor for her leg that was barely saved and the depression and panic she has fought against. One of our jewelry lines, Yuzu, is named after her beautiful granddaughter. Her father had been recovering in the hospital. We all shared N.’s joy when she showed us a picture in December of him finally able to eat again on his own and the prognosis looked good. Just before the New Year’s start, he took his life. The family is still reeling. N. cannot come back to work for awhile, as she doesn’t want to leave her mother alone. Yesterday I met her mom for the first time, and instantly loved her! She is gracious, kind, beautiful. And so sad. There were no words. But as we were leaving, Eric asked N. if we could pray for her. She called her two daughters, granddaughter and mother to the table, announcing that “Eric is a pastor and is going to pray.” (He’s not really, but whatever). We held hands and prayed for this dear family who has had wave after wave after wave of pain doused upon them. 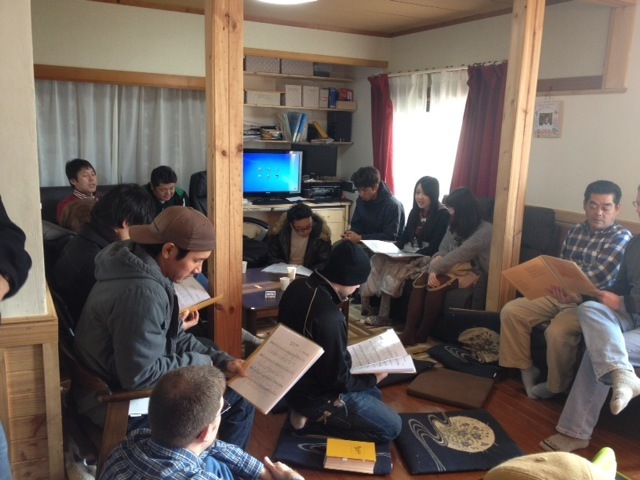 On Sunday morning we somehow crammed about twenty five adults into a living room- awesome! Keishi, one of the Be One leaders in Osaka, shared during our sunday morning worship about his dad. There were a number of Ishinomaki friends who came because of their relationship with him. 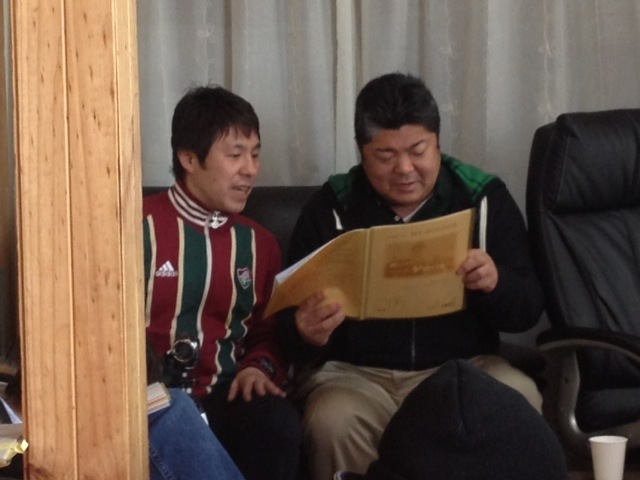 (Photo below: Keishi, left, with the president of a noodle company in Ishinomaki who has been helped by Be One). Here is a short summary of what he shared with us: Keishi had a very unhappy childhood. His father was abusive – punching in walls, pulling down cabinets, angry. When Keishi was seventeen, he made a plan to kill his father and then kill himself. He wanted to protect his mother and this was the only way he could think of. He went outside on the night he was going to pull this off, and passed a church. He decided before he died that it was worth going inside and praying once. As he sat and prayed in desperation for the first time in his life, he suddenly felt God fill his chest with hope and glory. Never been in a church before. Never read a word of the Bible. But God came and met him in his deepest pain, prevented this tragedy, and brought new meaning. Keishi began following Jesus from that night on. Fastforward thirty-some years. Keishi changed, but his father didn’t. So Keishi and his wife have taken care of his parents – financially, physically – many ways over many years. They have prayed without fail for God’s work in his dad’s heart. Keishi’s dad got cancer. His last months were in a hospital. The nurses hated caring for him because even in the hospital he was abusive and difficult. Keishi would sometimes get calls from the staff, “can you come in – we can’t control him.” He hated those calls. In December his dad’s health was steadily declining – he was often unconscious. Keishi and his wife were sitting by his bed one morning and they heard his dad say, “Jesus.” Keishi leaned forward – thought he heard wrong. His dad said it again- “Jesus.” Keishi couldn’t believe it. He confirmed with his dad – His dad wanted to trust in Jesus. I forget if it was that same morning or a few days later – his father was baptized in the hospital. A week or two later, Keishi felt God prompting him to leave work and go to the hospital. His dad was strangely alert. Keishi loaded him into his car, and together they drove around Osaka and looked at all Christmas lights and decorations. They laughed, and oohed and aahed together for several hours. For the first time in his life over those several hours, Keishi had a normal father-son relationship with his dad. They drove back to the hospital. After that, his dad was never really conscious again. He passed into eternity on Christmas Eve. Keishi is a man of great faith. He has prayed and seen God heal people. He has seen many miracles. But he said the greatest miracle of his life was seeing God change his father’s heart. Many in our service were touched by this awesome story. Many in that room have difficult fathers. We spent time after that sharing and praying together for our family members who need hope. Thankful this week that we have a heavenly Father. I pray God will continue to use our Be One extended team to bring hope and real transformation to the most painful places in people’s lives. Thanks, Sue, for sharing this post about fathers. My own father, after a difficult battle with cancer, passed away on Dec. 12, 2010, and we buried him just before Christmas. I am also thankful that he died in the Lord, as well as his example as a Christian. It’s great to hear stories like this one.